SSR Definition: A solid state relay may be defined as an electrical switch that changes its state when an external voltage is applied to it. Solid state relay has a capability to control a larger load current or voltage. Let us discuss these solid state relays one by one. Above circuit shows the circuit diagram for Reed Relay coupled SSR. 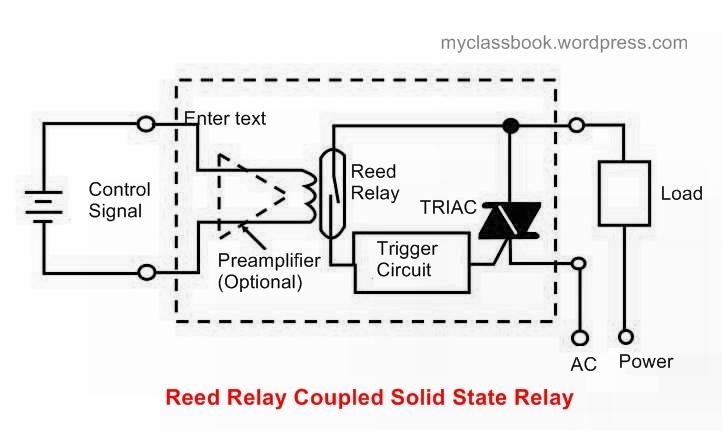 In this type of SSR control signal is applied directly or using preamplifier (if the control signal is weak) to the coil of a reed relay. This relay causes the operation of the trigger circuit which is used to trigger the power transistor or TRIAC. The second type of solid state relay is transformer coupled SSR. It uses a transformer for sending the control signal from primary windings to the secondary winding. A secondary winding is connected to the trigger circuit which is used for the triggering of thyristor switch. It also uses DC-AC converter if the input control signal is DC because the transformer cannot work with DC. Another type of solid state relay is photocoupled SSR. Above figure shows the circuit diagram of the photo coupled SSR. In this type of SSR control signal is applied to the infrared source or light source like LED. When it emits light, a photosensitive element like a photosensitive diode, photo-sensitive transistor or a photo-sensitive thyristor will sense that light and operates the load current through trigger circuit. It is obvious that the input and output circuit is completely isolated from each other since only light is used between them. Therefore sometimes this SSR is also called as “optically coupled” or “photo-isolated” SSR. Full Wave Bridge Rectifier – Circuit, waveforms and working principle. Half Wave Rectifier – Circuit diagram and working principle. Regulated Power Supply – circuit diagram and working principle. Single Phase Half Wave Controlled Rectifier With a Resistive Load.